HOUSTON, Texas — When then-Belinda N. Booker, a May 2002 graduate, was a student, she had many choices, “do I become a newscaster like Jackie Simien, a talk show host like Oprah Winfrey, or do I become Belinda N. Booker, the computer genius?” Well, she chose the latter, despite her love for news and computers almost equally. Then, she would soon fall in love with a classmate, Anthony Mays, who would later change her name to Belinda N. Mays in 2004. “I am a very academic person,” she said. In middle school, Mays recalled taking honor classes; high school was another story. “I wanted to have fun (in high school),” Mays said jokingly. But when she made it to Huston-Tillotson University, it was back to the dedication that was most rewarding in middle school. “I saw students who were smart, and I put my best foot forward.” The only “B” that Mays received was from her Calculus 2 professor, Dr. General Marshall. To this day, Mays feels that she received that B because she was late for class after having to move off campus her senior year. “That’s my story, and I’m sticking to it,” Mays insisted, jokingly and seriously. Mays said that she was like the nerd who everyone knew was smart. For example, when her classmates got a bit noisy in class, she would ask them to be quiet so that she could hear the professor. May’s dedication was evident because she graduated with a 3.95-grade point average. Mays started in mass communications and loved it. She wanted to follow in the footsteps of Oprah or Jackie Simien after watching Oprah on TV and having a visit from Simien at Mays’ Beaumont, Texas high school. Mays also enjoyed writing and asking people’s opinions on topics, so she wanted to perform these duties in the journalism field. Quite naturally, she declared the mass communications major. She would go on to work at the then-HT news station. She filmed basketball games, edited video, and often was seen hauling heavy camera equipment across campus to capture her next best shots. And just like Anthony swept her off her feet, a web design class did the same. In that class, Mays learned how to build websites and more such as flash animation. She fell in love with computers, so much so that she changed her major to computer science. “It was the instant feedback and feeling of you being able to create something” that drew Mays to computers. But as her high academic performance would have it, Mays had earned enough credits to keep the mass communications major as a double major. Although she had the “best of both worlds” with two majors, she needed to focus for her career sake. Mays credits Huston-Tillotson for setting her on a career path. The university held its semester’s career fair, and she submitted her resume to the local office of the U.S. Department of Veterans Affairs (VA). She received an internship there during her senior year, graduated, and was hired full-time with the office as a computer specialist. The VA office was not a typical VA service center; it was a process automation center. Mays’ job entailed writing code, and that code processed all bills and payroll and other financial information for the department. 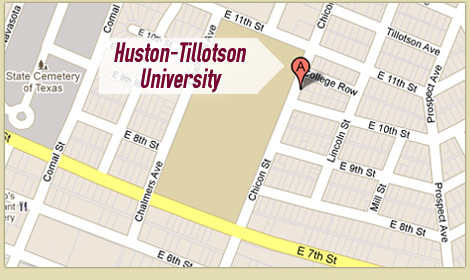 Mays recalled how her internship was a continuation of the great reputation that Huston-Tillotson set with its intern before Mays and more Huston-Tillotson interns that came after Mays. While working at the VA, Mays pursued a master of education in instructional technology at the University of Texas – Austin. The VA allowed her to work part-time while she worked on her master’s. With the concentration in instructional technology, Mays wanted to train adults on computer programming. Although she does not train as such today, she, however, writes training guides in her current position. After two years in Austin following graduation, Anthony received an assistant principal job in Dallas. The Mays moved to Dallas for that job, and Belinda searched for a new career opportunity. Soon, she would find an opportunity with Lockheed Martin, an American global aerospace, defense, security and advanced technologies company. Mays remains with Lockheed, today as a Business Systems Integration Analyst, following multiple promotions. Her position is vital as it helps to create workflow processes through integration and building of electronic forms. Oh, speaking of pink, Mays proudly is a member of Alpha Kappa Alpha Sorority, Inc., initiated through the Beta Kappa Chapter at Huston-Tillotson University. She held almost every leadership position in the chapter. For her interview during the application phase for the sorority, she spoke about her experience working with Anthony and the Student Government Association, of which he led as president. “He had me work with him to plan some SGA activities. We would have all kinds of activities such as lip sync. Back then, we would have VHS tapes, kind of karaoke style, record the tapes in the Union, and much more. We just had all of these events, once a month, that SGA sponsored for free. Another fond memory of her Huston-Tillotson years was becoming the student director of student activities through a newly-created scholarship. Her duties included the authority to approve and remove flyers. Now, fast forward back to Dallas where the Mays first lived, soon, the two would welcome their first child, a baby girl. Then, five years later, another girl arrived. Two years later, Anthony got his baby boy, who is now two years old. Small children mean that there is hardly a dead moment in the Mays’ home, now in Houston. When there is such a moment, Belinda seizes it to start writing on her fourth children’s book. That is right; Mays also is an author, or what she prefers to be called, a storyteller. Toastmasters held a speech contest, and Mays jumped in it. She wrote a speech about her father who was a military man (Air Force). She titled the story, “My Amazing Dad.” It was a thrilling speech that ended somehow with her dad fighting a roach. Yes, Mays laughed all over again. She won the contest and was encouraged to turn the speech into a story. Mays wanted to put characters of color out there. Mays found her purpose and is now living in it, enjoying her day job while serving her purpose. Her latest book, “I Am, God’s Affirmations for Little Girls,” is number one on Amazon under children’s Bible study reference books. She even was able to get Poet Nikki Giovanni to read the book. Giovanni, in turn, sent Mays a special note of encouragement and praise about the book. (While at HT, Mays was able to perform for Giovanni at a local poetry slam after tying for third place. That performance came full circle when Giovanni reconnected with her.) Mays wrote this book because her husband started teaching their daughters to recite their affirmations. At the time when writing her books, she did not have a son. Now, since she has a son, Mays looks forward to writing a book for boys. Mays eventually wants to start a nonprofit to be able to give books away, not just her books but all books that align with her life’s philosophies. She envisions giving away backpacks of books to every student at a high school in a disadvantaged community. “I want to go find these students and help spark an interest in reading,” she emphatically stated. Reading is personal to Mays. Mays is very pleased with her love story that unfolds to reveal a big heart for computers, communications, and family. View Mays’ books here: https://www.amazon.com/Belinda-N-Mays/e/B01FUEALCM.